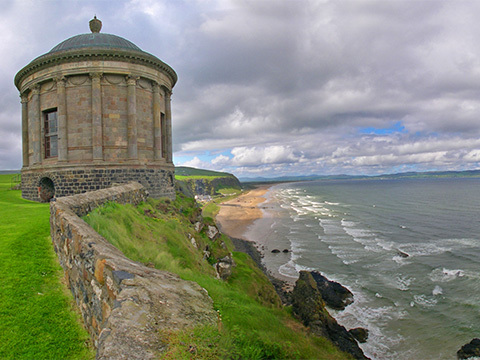 Mussenden Temple is situated in the beautiful surroundings of Downhill Demesne near Castlerock in County Londonderry. It perches dramatically on a 120ft cliff top, high above the Atlantic Ocean on the north western coast of Northern Ireland. It offers spectacular views westwards over Downhill Strand towards Magilligan Point and Donegal. On the Eastern side, there are views of Castlerock beach stretching towards Portstewart and Portrush and Fair Head. The temple was built in 1785 and forms part of the estate of Frederick Augustus Hervey, Bishop of Derry and 4th Earl of Bristol. Built as a library and modelled on the Temple of Vesta of the ancient Roman Forum, it was dedicated to the memory of Hervey’s cousin Frideswide Mussenden. Over the years, the erosion of the cliff face at Downhill seriously threatened the temple’s long-term survival and preservation. In 1997, the National Trust carried out cliff stabilisation work to secure the building. Downhill House was a mansion built in the 18th Century by the same Frederick Hervey, Bishop of Derry and 4th Earl of Bristol. He commissioned the work in the early 1770’s after he was made Bishop of Derry in 1768. At the time it was estimated to cost £80,000. The Demesne also includes a dovecote, walled gardens, a belvedere built for Hervey’s daughter and a mausoleum dedicated to his brother George Hervey, Lord Lieutenant ofIreland. The House was destroyed by fire in 1851 before being rebuilt in the 1870’s. It fell into disrepair after WW2 when it was used by the RAF. It remained in the Bruce family until 1946. The House was finally acquired by the National Trust in 1980. 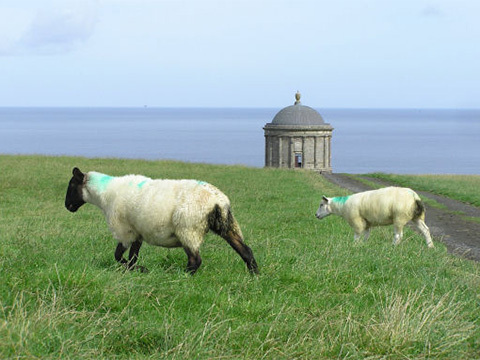 Mussenden Temple, however, has been in the property of the Trust since the1940’s.